This shy, nocturnal canine is very similar to the Red Fox, and is found state-wide. Description: A small, dog-like mammal with an elongated muzzle, moderately long legs, and a long, bushy tail with a black tip. Ears are erect and triangular shaped. The long, thick, soft fur is grayish with black streaks, especially along the top of the tail. Some reddish fur occurs mainly along the sides of the neck, on the backs of the ears, on the sides of the belly, on the legs, and under the tail. Cheeks, throat, and belly are white. The pupil is vertically elliptical. Similar Species: Red Fox is slightly larger, has a fur coat which is mainly orangish-red, and has a white-tipped tail. Coyote is larger in size, has a shorter tail, and has round pupils. Habitat: Usually prefers brushy edge habitat created by a mixture of woods and fields. Gray Foxes generally use more wooded habitat than Red Foxes. Diet: Although they are omnivorous, rabbits and other small mammals form the bulk of their diet. They will also eat fruit, berries, plants, insects, birds, and reptiles. Breeding information: Gray Foxes breed from January to mid-May with the peak occurring in February or early March. Females deliver their single, annual litter after a pregnancy averaging 53 days. A litter of 1-10 (average 3-5) pups are born in dens, which are usually located in hollow trees or logs, under rock piles, or underground. The newborn pups are blackish, blind, and have very little fur. By the time they are 3 months old the pups can leave the den to hunt with their parents. 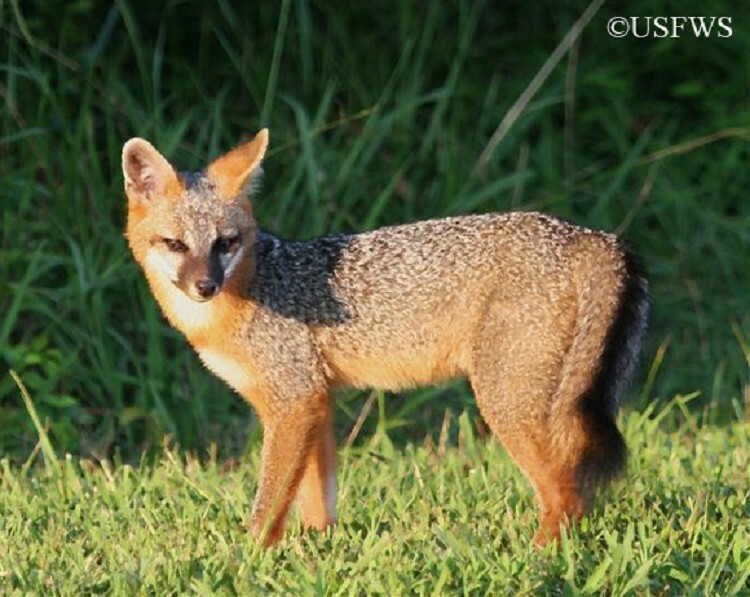 Status in Tennessee: Gray Fox can be common in some areas of Tennessee. They are both hunted and trapped in the state. Gray Foxes are the only canines that can truly climb trees; they use their front feet to grasp the trunk and their hind feet to push upward. Trees are used for sunning, foraging, and hiding from danger. Best places to see in Tennessee: Forests or brushy areas next to forests.